Catholic Schools New South Wales (CSNSW) is legally responsible for the funding arrangements across NSW’s 549 systemic Catholic schools. In 2018, the NSW Catholic school system will receive almost $2.6 billion in recurrent grants from the Commonwealth and NSW State governments and will raise, in the same period, almost $600 million from private sources, predominantly parental school fees. This document sets out the needs-based funding arrangements that will apply to the deployment of these funds for the benefit of our students. Despite hectares of newsprint and terabytes of online reporting, most people still find school funding confusing and contentious. It doesn’t need to be; once some simple facts are established, most people find school funding is clearer and much less controversial. State & federal governments fund all not-for-profit schools (government and non-government) to some degree because a school education costs much more than most people realise – approximately ​$12,000 per primary student and $14,000 per secondary student each year​. All government and non-government schools are funded according to the same benchmark – the Schooling Resource Standard (SRS), which is explained below. Taxpayers fund the entire SRS for all government schools – but only part of the SRS for non-government schools, whose parents are expected to make up the difference through school fees and other private fund-raising. ​Schooling is compulsory and beneficial to the nation; this alone is a good enough reason for taxpayers to support all schools to some degree. After all, governments already subsidise many other non-government services without controversy such as GP visits, prescription medicines, aged care, child care and private bus services. Let’s take a look at how school funding is calculated. Base amounts are set annually using the funding levels of ‘reference schools’ where 80% of students have achieved NAPLAN minimum standards for reading and numeracy in three successive years. The base amount plus disadvantage loadings make up the Schooling Resource Standard (SRS). This amount varies for each school according to its students’ needs. An outer suburban primary school with high levels of disadvantage might have an SRS of more than $18,000 per student, while a primary school serving relatively affluent families might have an SRS of under $12,000 per student. State and Federal governments jointly fund 100% of the SRS for government schools – regardless of the school’s location or socioeconomic status (SES). Government schools may still raise money privately, but they will not lose a dollar of their SRS funding. Non-government school parents are expected to fund some of their children’s education according to their ‘capacity to contribute’ (CTC). Currently, this is estimated using ABS household census data and students’ addresses. From 2020, it will be based on parents’ personal income tax data, a more accurate measure of CTC. Based on this information, each non-government school receives a socioeconomic status (SES) score from 60 to 140. The higher the score, the more the school’s parents are expected to contribute – and the less government funding that school attracts. The reduction in government funding is called the CTC discount. 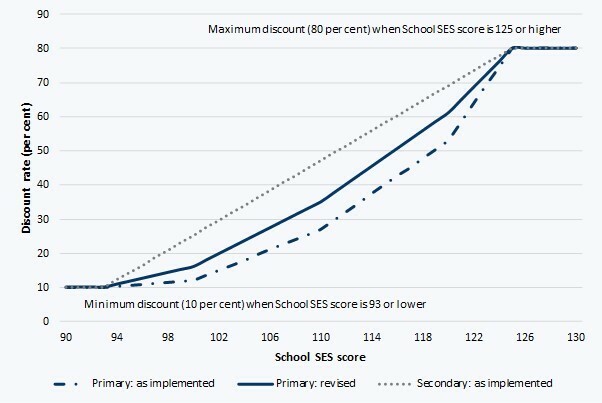 The non-government schools serving the lowest SES communities – those with an SES score of 93 or less – attract 90% of their base funding from the government, ie, their CTC discount is just 10%. As SES scores climb from 94 to 125, the discount grows and parents are expected to contribute more in school fees. All schools with an SES of 125 or higher have a CTC discount of 80%, ie they attract just 20% of their base funding from government. The following table shows the relationship between SES scores and CTC discounts. Source: Australian Education Act 2013 (Cth), s. 54 and Australian Education Amendment Act 2017 (Cth), s. 36. As the table below illustrates, the most disadvantaged non-government schools (those with an SES score of 93 or less) will in 2018 attract the most base funding – $9,858 per primary student and $12,388 per secondary student (plus any applicable funding for disadvantage). 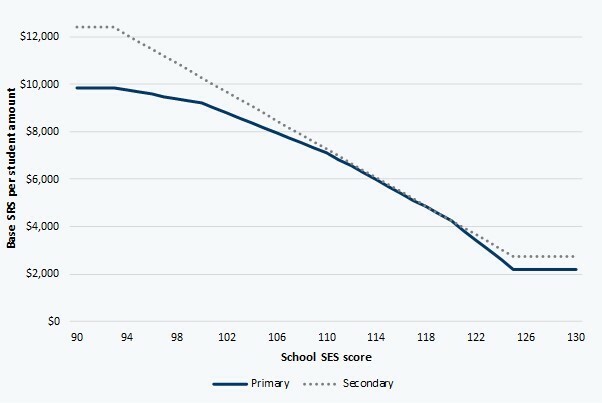 The most advantaged non-government schools (those with an SES score of 125 or higher) will only receive $2,191 per primary student and $2,753 per secondary student (likewise, before any applicable funding for disadvantage is applied). Source: Australian Education Amendment Act 2017 (Cth), s. 12, 13 and 36. Some people might be asking – why do schools charging more than $20,000 in fees receive any government funding at all? Surely this amount would higher than their SRS. Any school that can charge such fees is unlikely to be educating children from disadvantaged families. The answer is that all schools receive some government funding and that funding is based on the school’s SES score, not the income it can raise. It is irrelevant how much (or how little) funding a school actually raises from its parents. In fact, there is no obligation on non-government schools to raise any funding from parents. A school will still attract the same level of government funding whether it charges parents $5,000 or $25,000 per student per year – or nothing, if it chooses. The level of fees charged do not affect the base government funding it attracts. Funding for schools that are part of a system is calculated as outlined above, but distributed differently. The Commonwealth calculates an SES score for each school in a system, then provides a lump sum to the relevant state or territory government to pass on to that school system, along with its contribution (the Commonwealth provides approximately 80% of the government funding a non-government school attracts, while the state or territory government provides the remainder). For Catholic system schools, each state and territory’s approved system authority receives a single amount of combined Commonwealth and State recurrent funding to distribute to its diocesan Catholic schools offices, based on enrolments and student needs. Each office then determines how many teaching and other staff are required at each of its schools, based on the number of students and their needs. The office then resources the school accordingly. Governments permit systems to distribute funding this way because systems have a more detailed understanding of each school’s local needs. Catholic Schools NSW (CSNSW) is the approved system authority for NSW, which has 549 Catholic system schools operated by 11 diocesan schools offices.